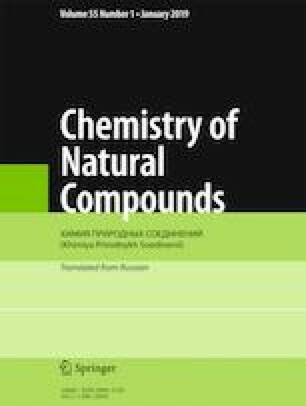 A new flavone, berberisinol (1), has been isolated from the EtOAc fraction of the MeOH extract of Berberis baluchistanica, along with known compounds, palmatine (2), berberine (3), 8-oxoberberine (4), β-sitosterol (5), oleanolic acid (6), and gallic acid (7), isolated for the first time from this species. Spectroscopic techniques including two-dimensional NMR were used for structural elucidation. Berberisinol (1) showed significant antibacterial and antioxidant potential. Published in Khimiya Prirodnykh Soedinenii, No. 2, March–April, 2019, pp. 214–216. We are grateful to Prof. Dr. Abdul Malik of HEJ Research Institute of Chemistry, University of Karachi for his help in structural elucidation of isolated compounds.